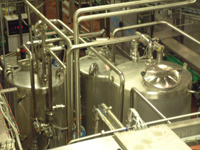 The process plant that Enterprise will supply you can be from single items of plant to a complete processing room. For soft drinks we would supply a simple syrup room which can either have a fully automatic hot / sugar dissolving system or a manual system. This would be followed by syrup storage and pasteurisation depending on the sugar quality. The next stage would be the finished syrup room where the concentrates are added to the simple syrup and blended for sending to the premix unit where the final dilution with water takes place. 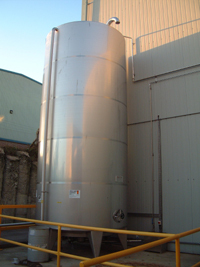 Enterprise Tondelli can supply a syrup room which is fully automatic which has minimal tanks and utilises in-line continuous blending of the concentrates, simple syrup and water. We have supplied plants that meet the requirements of the major franchises such as Coca-Cola and Pepsi Cola taking into account the relevant retention times required etc. A key item is also the CIP plant which can be semi automatic or completely automatic as required. Water filling plants can have filtration or also certain type of water processing that we can offer dependant on local legislation. This can include ozonisation to remove iron and manganese or just to sterilise the water. We also supply complete water treatment plants the configuration of which will be dependant on the water analysis given. 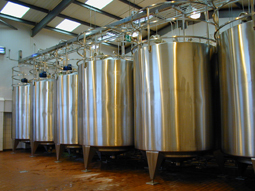 We offer brew houses for breweries which are usually modular. Also the ancillary plant required as well. The vegetable processing plant includes the full range of equipment from washing, grading, destoning, destemming, sorting, sterilising, coring, filling etc. The equipment can be used for root vegetables, fruit and salads. From a single potato washer to a complete salad preparation line. Semi automatic syrup room for the UK with a production of 120,000 litres/hr of soft drinks. Working with Enterprise Tondelli is dealing with those who understand your process and your requirements. Over the last 30 years we have gained valuable experience so whether you require a single piece of equipment or a complete process plant Enterprise Tondelli will meet your requirements.